CogniTropic™ is a new genre of world-class, full spectrum botanical ingredients combined together in one formula to deliver the cognitive results you have been waiting for. Leading the list of these clinically reviewed ingredients includes the well-researched, all-natural spearmint leaf, patented as Neumentix™, coupled with an extract of whole fruit from the Coffea arabica plant, patented as NeuroFactor™. This masterpiece is then anchored by a naturally fermented Choline L-Bitartrate (not the synthetic DL-tartaric acid form) and Organic Rosemary Leaf (noted from ancient times to be associated with “remembrance”). Never before has such an impressive lineup of all-natural, ingredient super-stars been assembled into one supplement without undesirable excipients. How does our spearmint extract work? 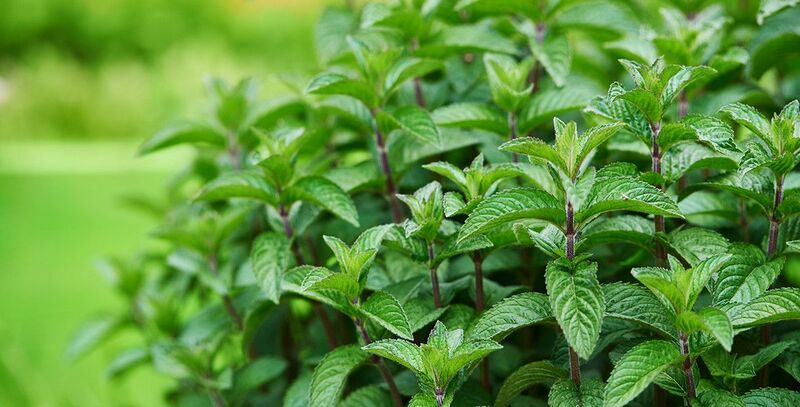 We have used Neumentix™, a water-extracted, natural ingredient sourced from spearmint because it has been selectively bred to contain high level of polyphenols, such as rosmarinic acid. This exciting cognitive ingredient is targeted to support cognitive performance, specifically focus and working memory, without disrupting sleep at night. These benefits are clinically supported for healthy young adults as well as older individuals with age-related memory issues. Increase in acetylcholine, a neurotransmitter actively involved in learning and memory processes. Researchers found healthy men and women 50-70 years old with age related memory issues, who were given 900 mg of Neumentix™ for 90 days, experienced 15% improvement in working memory and reported an improved ability to fall asleep. 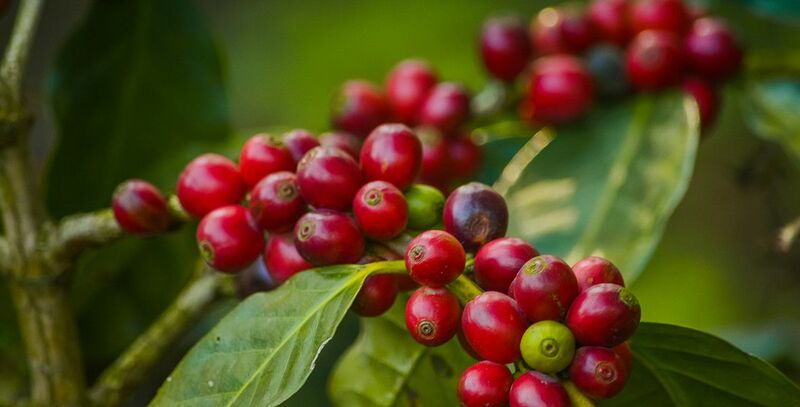 The outer fruit of the coffee bean has remarkable cognitive support properties. 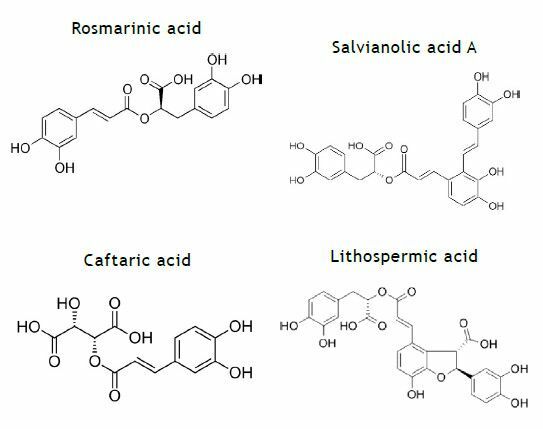 How does our whole fruit extract of Coffea work? PRL has chosen NeuroFactor™, an all-natural, patented extract of whole fruit from the Coffea arabica plant, as a key brain support ingredient in CogniTropic™. This extract contains a unique profile of polyphenols that have been shown in clinical studies to stimulate the production of Brain-Derived Neurotrophic Factor (BDNF), a key neuroprotein involved in overall brain health. BDNF (Brain-Derived Neurotrophic Factor) has been widely reported to play a critical role in neuronal development, maintenance, repair, and protection against neuro-degeneration. Neuroscience now suggests that increased BDNF levels may help mitigate the advance of cognitive challenges in human subjects. 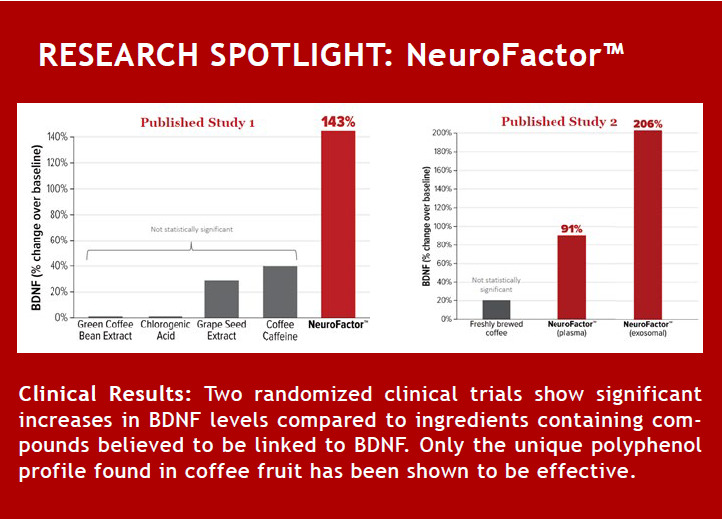 NeuroFactor™ is a novel, natural botanical shown to significantly increase serum BDNF levels in two double-blinded, placebo-controlled studies of healthy human subjects. What Else Can I do to Increase BDNF Naturally? Sunlight: get at least 20 minutes of natural sunlight on the skin daily. CogniTropic™ is an all-natural botanical formula scientifically targeted to promote Brain Derived Neurotrophic Factors (BDNF) and cognitive performance by boosting memory, higher thinking, attention, learning, mood and sleep. Why is Choline Included in Our Formula? Choline is a material requirement of cells for their membrane structure and metabolic control. Its presence is integral in maintaining a balance of key biochemicals needed for cell growth, function and repair. Choline is indispensable for its enabling roles in metabolism and mobilization of other micro- and macronutrients, including vitamin cofactors, amino acids and lipids. Other effects of choline are indirect in that it impacts the balance of and need for many other partially compensatory metabolites to which it is closely related, via its influence on the activity of certain regulatory genes or the catalytic proteins they express. Dietary intake of choline is known to affect the availability of the nutrient to the tissues and organs whose viability depend on it. Intake of choline is absolutely essential since the body does not produce enough, even under ideal conditions. While choline exhibits nutritional synergies with vitamins involved in folate metabolism and the methionine cycle, such as vitamin B6 and vitamin B12, and nutrients such as omega-3 fatty acids, none of these substances can functionally replace it. Deficiency in these complementary nutrients elevates the need for choline in the diet. Choline is a biochemical “building block” that is important in the synthesis of cell membranes and agents of neurotransmission and cell signaling. It is necessary for the transport of fat from the liver and participates in chemical reactions that reduce plasma homocysteine.